Numbers for a smaller quantity of dough which should give you two good sized medium loaves of approx 630g each (baked weight) or 1 and a half lbs – and thus less likely to make a mixer struggle. 640g bread flour – the final shape and lift of the loaf will depend in part on the type of flour you use, I tend to use about 50% very strong flour to get the crumb that Brian likes amd vary the other half to use stone milled flours. 20-30g of melted butter. I thnk it improves keeping quality and softness but you can leave this out or experiment with an oil you like instead. Dough takes between three to four hours to develop to the point at which you shape it. I suspect it would start to get more sourdough like in taste if you retard it and that is not my goal with this bread. My aim is to get it baked roughly 6-8 hours after the final mix. You can divide this into two and shape and bake in tins or shape free style, or make rolls, stuffed breads etc. If you mix with more water and maybe olive oil you could try for a foccacio type bread too. Possibilities! I used new Herbert Birnbaum 750g oval banettons with wooden bottoms for these loaves, like my very first ones from Germany, where I ended up sending Euros in an envelope, not a method I would recommend! These ones were purchased from The Weekend Bakery using PayPal (see Friends and Inspirations page for links) who offer excellent customer service and have a wonderful site packed with bready knowledge. You don’t need banettons to make this, you can shape freeform or use tins or improvise with a colander and an old well floured teatowel, or buy a florist’s wicker basket and line with a cloth. 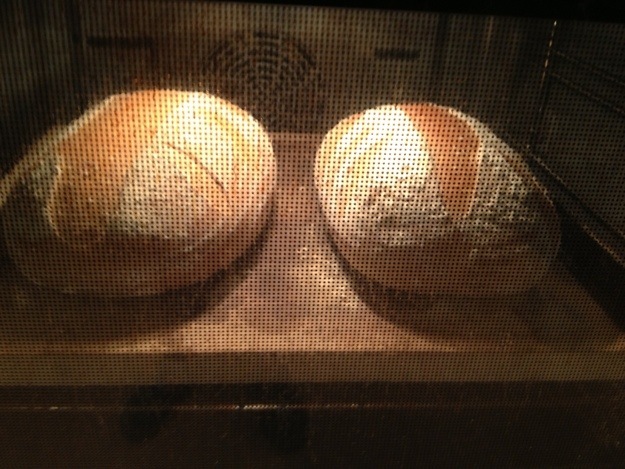 Fran (aka Narf7) has just sent me photos of her uber cool home made organic soya kefir bread! Hoping she will write a post soon so I can link to it. Link here now! I love the way bread brings people together across the world. Waves madly at Tasmania! ‘Of bread and quinces’ has blogged here about ‘milk kefir bread and what we have in common’ and here on a water kefir hazlenut sage bread! and my friend Fran M (aka Fancybake who lives in the North of England) has been busy making kefir bread too, she doesn’t blog so here is a picture that she sent me of her raisin kefir bread. She is a wonderful home baker who I met in Yorkshire. and Pete in Swindon has made a formidable loaf topped with sesame seeds – read his delightful blogpost by clicking on the link. If you have a go and don’t blog and want me to add a photo here let me know in a comment or if you want me to link to your blog post I will add it in here. This entry was posted in Bread, kefir and tagged date syrup, kefir bread, vegan bread on 08/09/2013 by Joanna. Here is one for my kefir buddies! For those of you reading this for the first time, kefir is a living fermented product made by an organism commonly referred to as a ‘kefir grain’. It isn’t a grain but a culture in the acetobacter family that includes kombucha and vinegar mother, ginger beer plants and so on, that looks a bit like a brain or a cauliflower. It grows and lives in milk but is chiefly interested it would seem in the sugars that it finds in there. You can either get kefir grains from a nearby friend who has spare or buy them online from various sources. I believe you can buy kefir in cartons in some places, I have no idea if that would work to leaven bread as I have no experience of it. Once you have some healthy grains, they should last a long time, reproducing and being happy providing you treat them right. There are various websites devoted to all things kefir if you have a little search. I don’t drink kefir unlike some people, but I do make a sort of soft cheese with it which I love and I bake bread, using it as an alternative to both conventional yeast and sourdough starters. I have changed the formula I have used previously for the kefir bread to make a pre-ferment which doesn’t separate into a watery layer and a top bubbly layer. I am pleased with the results this new formula gives. The preferment came out looking much more like a regular sourdough ferment though it smells nothing like it. My formula makes two large 900 gram loaves, so you will need to cut the quantities back if this makes too much bread for you. I have frozen one of my loaves from this bake. I was inspired by Fran who blogs half a world away in Tasmania at The Road to Serendipity – she is expert in kefir and its ways. She juggles her feeding routines between home made soya milk and milk and has found that kefir grains are greedy for her home made date paste. I don’t have any date paste but I do have Basra date syrup* and I thought this might give a lovely colour to the finished loaf as well as be less sweet and insistent in taste as the honey I have been using up to now. We really like this bread. It ticks the box of having a soft open sourdough style crumb, no sour taste (so not one for all you acid bread lovers) a bit of extra calcium for me and a gentle subtle flavour and a lovely colour crumb. It is as good with sliced chicken and garden lettuce as it is for morning toast. I am going to make this one again. Mix these well together and leave in a covered bowl for approximately 18 hours in a warm room (20 – 22 C) at which point it should be bubbling and thick and looking ready to go. Using a Kenwood Mixer I put the starter in first, added the water and then the flours and mixed for about three minutes on the lowest speed. Leave to develop in the bowl for 20 minutes. Sprinkle the salt over the dough and trickle the melted butter in while the mixer is going and continue mixing till the dough comes away from the sides of the bowl. You may need to adjust the dough with more water if your flour is very absorbent. I took the dough out once it was reasonably developed and put it into a big bowl, covered with a teatowel, and left it for about three hours. During this time I folded it in the bowl twice, as much to see how the fermentation was progressing as anything. Folding in the bowl is simply picking up the dough from one side and pulling it out and over the main bulk of the dough, like light kneading except you don’t put it on a board. You can put it on a board. There are no rules here! Once it was showing good signs of activity and had increased in size by roughly a half. I weighed it into two equal portions. Then I split those two portions in the ratio 85:15 using the % function on my scales. If you don’t have one of those, it would be about 135g for the small ball to 765g for the main ball. With the first portion I made a boule which I divided into four quartiles with a thin dowel rod and made a smaller boule with the small ball and put that in the middle. With the second portion I made a pointy ended baton and then a plait with the remaining ball which I placed along the top of the dough – because the dough had such a long second prove this didn’t come out quite as I had hoped but I like the effect that it gives anyway. A good way to create a nice looking effect on a loaf if you are finding slashing difficult. I put both loaves on baking paper on trays and tucked them inside clean binliners to prove. Second proof time was about three hours. Be patient, these are just as slow as a more traditional sourdough to rise. I eggwashed the crust with a mixture of egg yolk and kefir whey and sprinkled a few sesame seeds on top for interest. 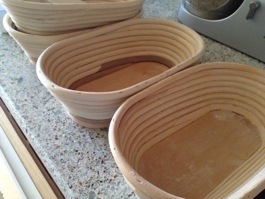 Bake in a preheated oven (with steam) either on the trays or slide them off onto a baking stone or kiln shelf which is what I use rather than a stone. Starting at 220 ºC for the first twenty minutes and then dropping back by stages to 190 ºC for the last ten minutes of the bake. About 40 – 45 minutes in all. Leave to cool on a rack as normal once you are satisfied the loaf is cooked, a nice hollow sound when you thump it is a good sign. For a .pdf file of the recipe click here → Date Kefir Recipe.pdf. *Basra Date Syrup is available online and you can find it in quite a few shops in Bristol these days, like Bristol Sweet Mart in St Marks Road, Easton. My camera is away at the menders so hope these pictures give you a reasonable idea of how the bread came out, a borrowed camera is never quite the same. And now you can see how Fran (Narf7) got on with this when she adapted it brilliantly to her vegan kefir by clicking here and visiting her Tasmanian kitchen. This entry was posted in Bread, kefir, Recipes and tagged alternative to sourdough, Basra date syrup, date syrup kefir bread, home baking, kefir bread, recipes on 10/08/2013 by Joanna.